Swiss Traditions: As the inspiration behind the Swissmar "Biel/Bienne" fondue, the Swiss city of Biel/Bienne is rich in Swiss heritage, innovation and quality craftsmanship. Known as the heart of the Swiss watch-making industry, this scenic and historical city thrives on highly-specialized precision manufacturing and is the home of the most prestigious luxury watches in the world. The city of Biel/Bienne lies at the foot of the first mountain range of the Jura Mountains. It is located on the language boundary and is bilingual throughout. Biel is the German name for the town and Bienne its French counterpart, but it is often referred to in both languages simultaneously. Meat fondue originated in France in the middle ages. During the grape harvest, pickers set up pots in the vineyards to cook their meals as it became convenient for them during the day. This ensured a leisurely lunch that could be enjoyed hot and fresh. In later years, meat fondue Beef Bourguignonne was created and became known as the original meat fondue recipe. Today this original recipe has evolved in many variations to include using chicken, seafood and much more. 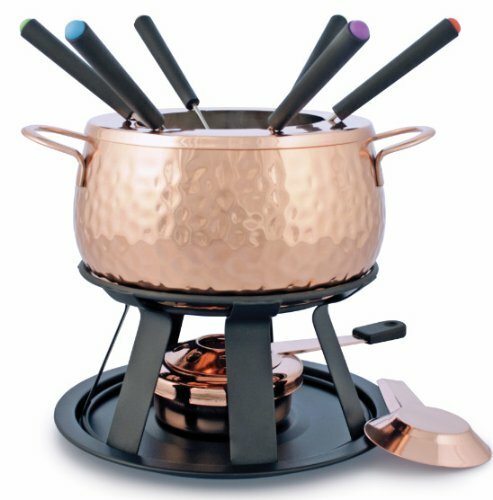 The Biel 11 Piece Meat Fondue set in copper has the traditional look of a fondue set down to the copper plated fondue burner. The set includes a copper plated fondue burner, copper plated fondue pot, splatter guard, rechaud, 6 forks and recipe card.